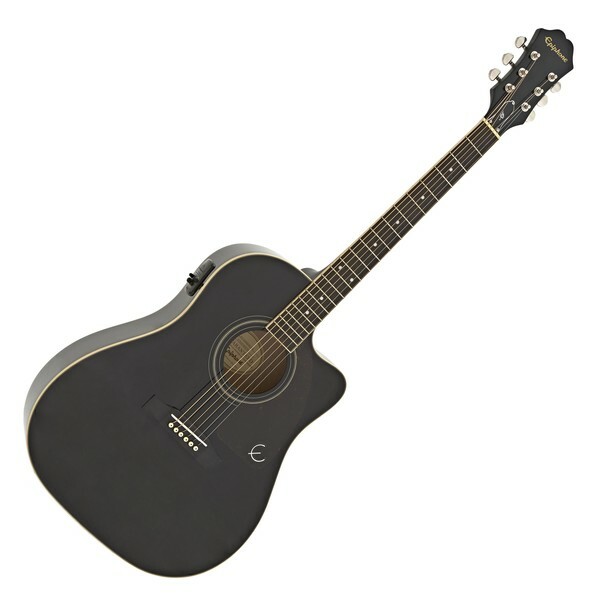 The Epiphone AJ-220SCE Electro Acoustic, Ebony is a reliable and accessible instrument with a versatile and expressive sound. The AJ-220SCE is crafted with mahogany back and sides, that deliver rich, full-bodied tones with plenty of resonance; and it is topped with solid Sitka spruce, that enhances the tone with crisp and focused highs and excellent response. The iconic 'Advanced Jumbo' body shape offers excellent projection and volume, while its ergonomic cutaway provides easy access to the upper frets for a comfortable playing experience. 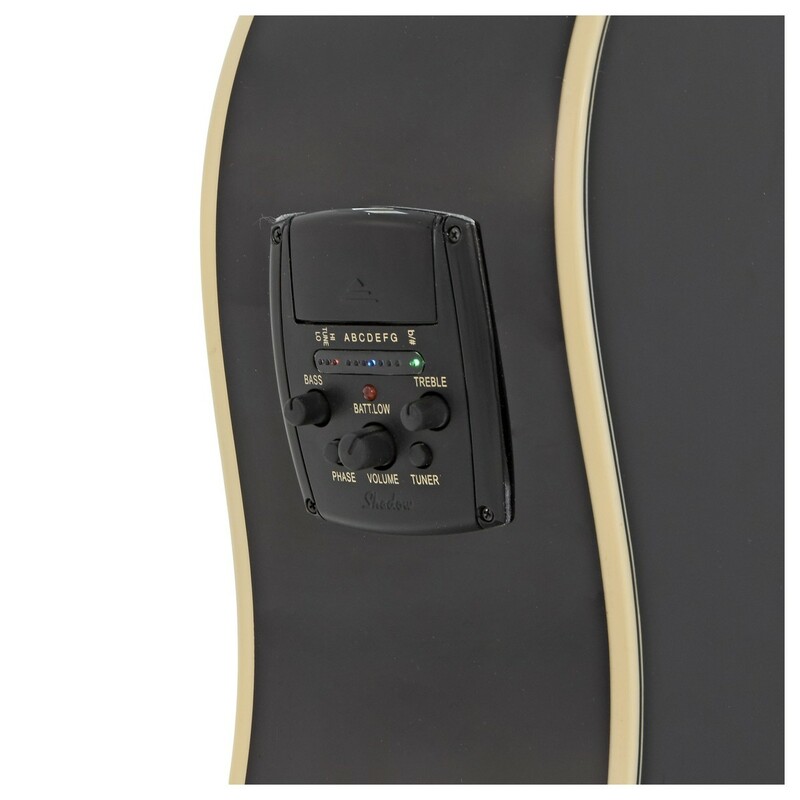 The addition of premium Shadow Electronics including a Performer Tuner Preamp System and a NanoFlex Pickup, provides incredible acoustic tones when plugged in. Other features include a built-in chromatic tuner, 2-band EQ and phase switch for a versatile performance. 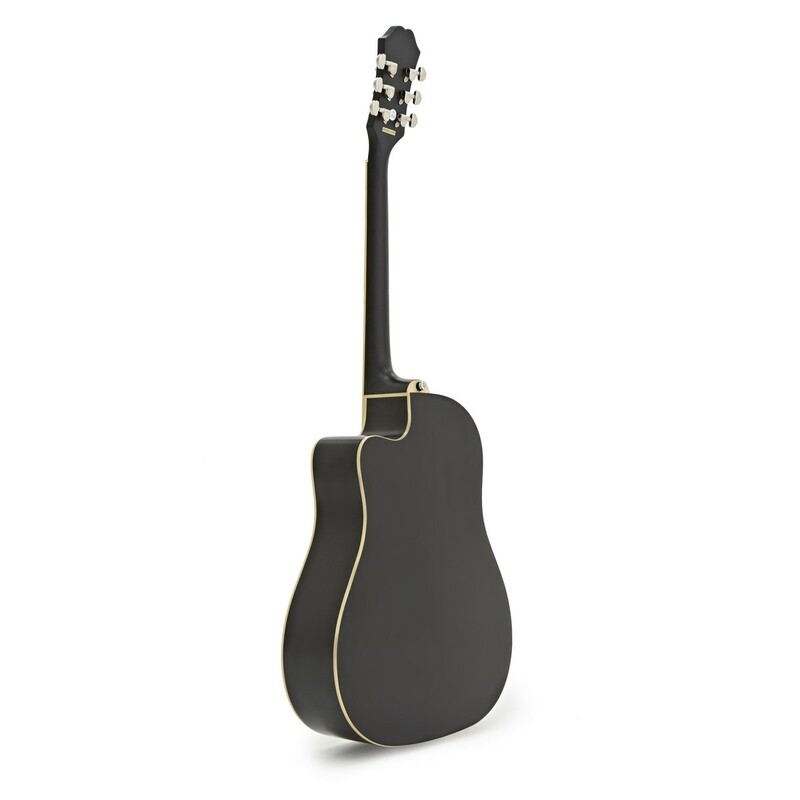 Finished in a sleek Ebony and complete with a tortoise-shell pickguard, the Epiphone AJ-220SCE Electro Acoustic looks just as good as it sounds. 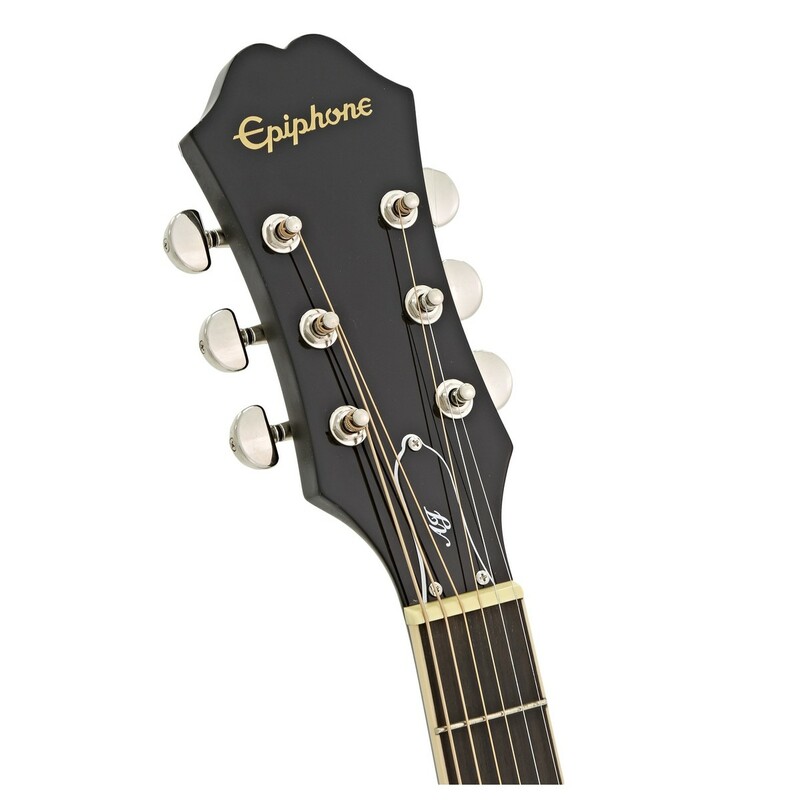 The AJ-220SCE features Epiphone's 'Advanced Jumbo' (AJ) body, which is said to resemble a bell with large, lower bout and a narrower upper bout. This results in an overall balanced tone, that rings crisp and sweet for the highs, yet deep and rich for its lows. The AJ also offers tight and clear mids, with excellent amounts of response and focus, creating a versatile guitar. The AJ Guitar has a convenient single Venetian cutaway, that provides players with comfortable access to the higher frets, as well as adding elegance to the appearance. The Epiphone AJ-220SCE Guitar is equipped with premium Shadow Electronics, including a Performer Tuner Preamp and a NanoFlex Pickup System. 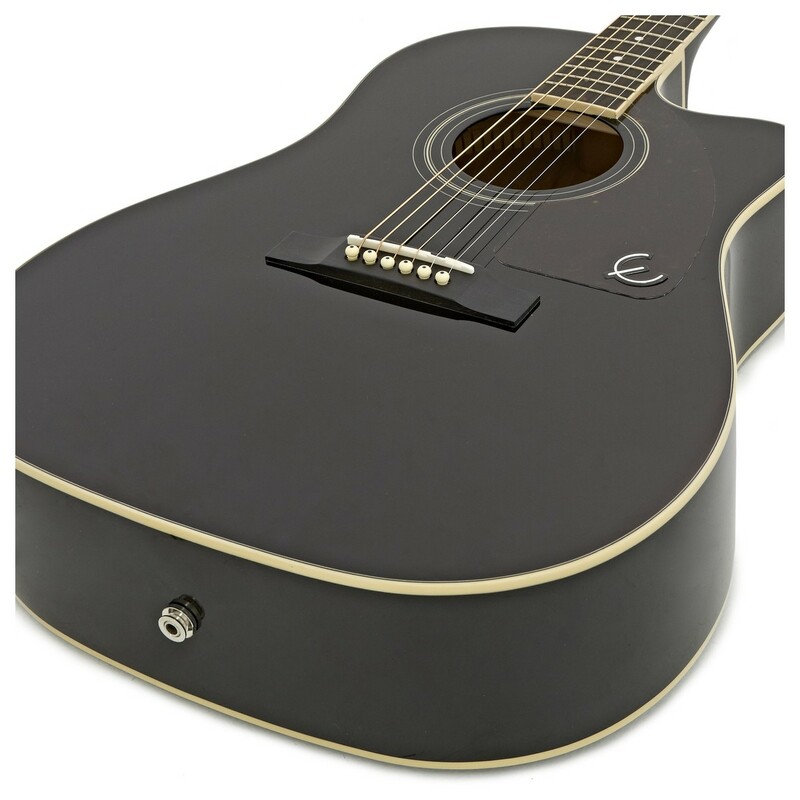 The preamp allows acoustic players to plug in and project their tones beautifully, as well as providing access to a convenient built in chromatic tuner, and shaping controls including 2-Band EQ, Master Volume, a Tuner/Mute button and a Phase Switch that cuts the feedback, without affecting the guitar's tone. 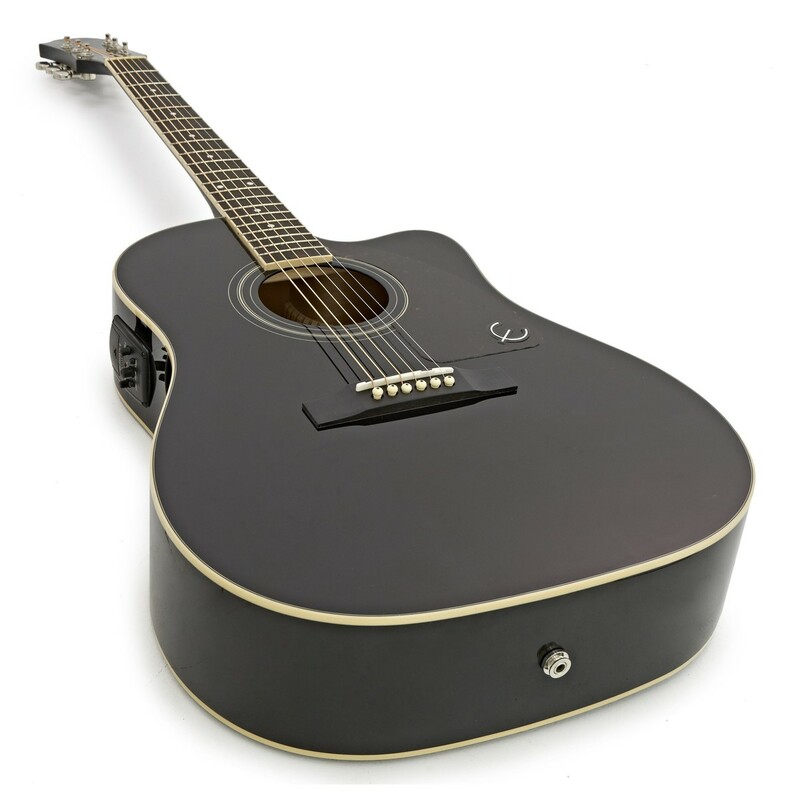 The NanoFlex Pickup is located under the saddle, and it provides a 'truly acoustic' tone by combining both body and string tone for sonically pleasing amplification. Crafted with mahogany back and sides, and topped with solid sitka spruce, the Epiphone AJ-220SCE Electro-Acoustic Guitar delivers an array of sonically pleasing tones to suit different playing styles. Mahogany provides a rich, sonic warmth, with plenty of resonance and it offers thick, meaty mids; deep, woody lows; and good amounts of bite. The mahogany combined with the sitka spruce top, extends the mahogany's tonal range to enhance the overall sound with bright, tight and expressive characteristics. The sitka spruce top also delivers wide dynamic response, as well as a direct and focused tone. Constructed from mahogany, the neck infuses the Epiphone AJ-220SCE with beautiful warmth, resonance, and a clear top end. Using mahogany for both the body and neck enhances its natural resonance, allowing it to respond well to numerous techniques and playing styles with ease. The neck is topped with a rosewood fingerboard that adds warmth and clarity to the overall tone, while its smooth surface provide a comfortably energetic playing experience.